Four Prong dogbone adapter connects a generator with a L14-30 locking plug receptacle to a standard 30 Amp power cord. No more struggling to wiggle the plug loose from the park outlet! 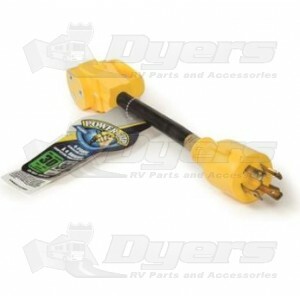 This generator adapter has integrated an pull handle to make electrical hook-up easy. 17" L end to end not including prongs.